Lakshadweep is the most spectacular group of islands that are poised elegantly over the profound Arabian Sea. It is one of the most spectacular islands that the planet comprises. This exotic cluster of island is situated about 200 kms off the shoreline of Kerala. The island is enriched with myriads of features that lure the travelers. The incredible aspects of Lakshadweep not only include the natural creativity but also comprise the fascinating heritage of ecosystem and ethnicity. The island even boasts a National Ecotourism Award which it got in 1997. The islands are dotted with intriguing attractions but the prominent one remains the bewitching coral reef. The coral reef that the island comprises seems to be a unique mix of vivid colours. The formation itself is just incredible. These coral reefs with its spectacular charm hold the visitors back and make them to visit the islands again and again. The 4200 square kilometers of lagoon over the deep sea is enriched with incredible aquatic life. The underwater world of the Lakshadweep islands offers myriad of options to explore and enjoy. The vistas that it presents to its travelers are beyond verbal description. Apart from the breathtaking natural splendor of the lustrous marine, the island is prominent for the adventurous water activities like swimming, wind-surfing, diving, snorkeling and kayaking. The island is emerging as a prime tourist island of India with such exotic experiences. Lakshadweep is offering a most splendid holiday experience to its visitors. Lakshadweep Island is best explored by M.V Kavaratti. Lakshadweep Samudram is one of the perfect ways to enjoy the incredible natural charms of the islands. Lakshadweep Samudram is the name given to the exclusive five-day cruising of the cluster of islands in Lakshadweep. The cruising of these elegant island is done by the special ship namely M.V Kavaratti. The cruise takes visitors to the prime islands covered in Lakshadweep - Kavaratti, Kalpeni and Minicoy. The cruising starts early in the morning with lunch and refreshments provided on shore. During the night, visitors rest on board with best accommodations. However the day is replete with adventurous activities and excursions like Swimming, snorkeling and other water sports. Coral Reef is the name given to a special Four-day cruise structured to cover the prime islands of Lakshadweep - Kavaratti, Kalpeni, Minicoy and Kadmat. The ship which is used in this cruise to bestow a world class experience is named as MV Lakshadweep Sea & MV Arabian Sea. The cruise will take its visitors to excursion during the day whereas the nights would be on board. Lunch and time to time refreshments would be provided throughout the day excursion. 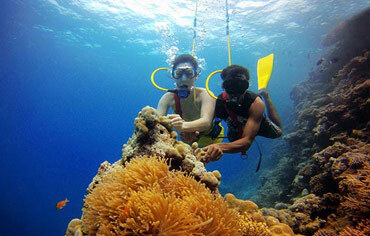 Day excursion would also include some intriguing water activities like snorkeling, scuba diving etc.